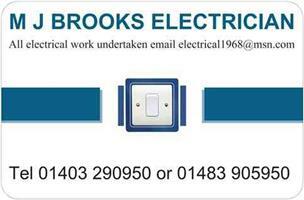 M J Brooks Electrician - Electrician based in Slinfold, West Sussex. Hi, I am Michael Brooks. I have more than 30 years’ experience in the electrical trade. I was originally based in Woking, Surrey however I am now based in West Sussex. (I still work in the Woking area). The areas that I cover are Sussex, Surrey, Berkshire & London.